Vladimir Maliagin “THE JUSTICE OF HUMANITY” 2003. Graduates of Klaipeda University Faculty of Arts Directing Department in Berlin on the occasion of the graduation and in their course leader's Gytis Padegimas homestead in Juškonys, where traditionally meet every year. “STONES IN HIS POCKETS”. Kaunas Chamber Theatre, 02.19.2016, 20, 21. Educational books by Gytis Padegimas : "Teaching of Michael Chekhov’s creative method" and "The History of Directing" (2016, issued by Klaipeda University). Thornton Wilder "RIVERS UNDER THE EARTH". Kaunas Chamber Theatre, 03.12.2016. Gytis Padegimas "ALKSNIŠKĖS”. Kaunas Chamber Theatre, 02.16.2017. The 20th International Strindberg Conference STRINDBERG AND THE WESTERN CANON, June 1-4, 2017, Krakow. Giedrius Kuprevičius (composer), Herkus Kunčius (libretto). 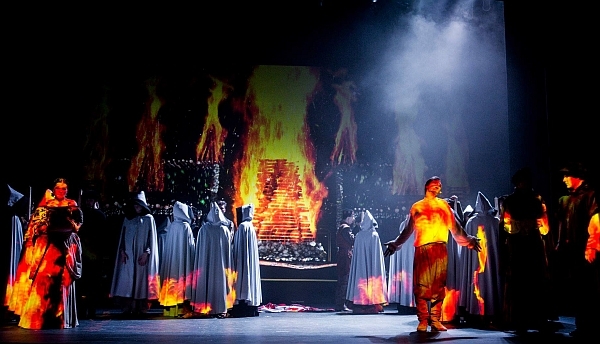 Theses opera "LUTHER’S DOORS". Lithuanian Russian Drama Theatre (Vilnius), 21.11.217, National Kaunas Drama Theatre, 12.12.2017. Photos Dmitrijus Matvejevas. Brian Friel "PHILADELPHIA, HERE I COME. Alytus City Theatre, 12.10.2017. Photos Povilas Jaras. Adam Rapp “NOCTURNE”. Kaunas Chamber Theatre, 16-18.03.2018 (at the Kaunas Central Bookstore), 23.03.2018 (at the Kaunas County Public Library). 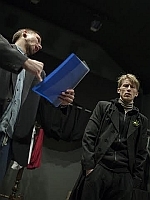 In the photos of Dmitrijus Matvejevas and Donatas Stankevičius - starring actor Dovydas Stončius and stage director Gytis Padegimas. Albert Camus “Caligula (1,2,3)", 1989. Martin McDonagh “The Beauty Queen of Leelane ”, 2001. Vladimir Maliagin “Court of People's Law ”a, 2003. Tennesse Williams “The Night of Iguana ”, 2004. All rights are reserved. Unauthorised copying, public performance without author or www.padegimas.com are prohibited.